Satellite data acquired during 1 January-9 July periodically (a few times a month) showed volcanic plumes originating from Michael on Saunders Island. A thermal anomaly was last detected on 3 April 2018. Historical observations of eruptive activity on ice-covered Mount Michael stratovolcano on Saunders Island in the South Sandwich Islands were not recorded until the early 19th century at this remote site in the southernmost Atlantic Ocean. With the advent of satellite observation technology, indications of more frequent eruptive activity have become apparent. The last confirmed eruption evidenced by MODVOLC thermal alerts was during August-October 2015 (BGVN 41:02). Limited thermal anomaly data and satellite imagery since then have indicated intermittent activity through September 2018. Information for this report comes from MODVOLC and MIROVA thermal anomaly data and Sentinel-2, Landsat, and NASA Terra satellite imagery. Evidence for thermal activity at Mount Michael tapered off in MIROVA data from October 2015 through January 2016. MODVOLC thermal alerts reappeared on 28 September 2016 and recurred intermittently through 6 January 2017. Low-level MIROVA thermal signals appeared in June and September-November 2017. During January-September 2018, evidence for some type of thermal or eruptive activity was recorded from either MODVOLC, MIROVA, or satellite imagery each month except for May and June. Although MODVOLC thermal alerts at Mount Michael ended on 8 October 2015, the MIROVA radiative power data showed intermittent pulses of decreasing energy into early January 2016 (figure 10, BGVN 41:02). At a high-latitude, frequently cloud-covered site such as Saunders Island, this could be indicative of continued eruptive activity. 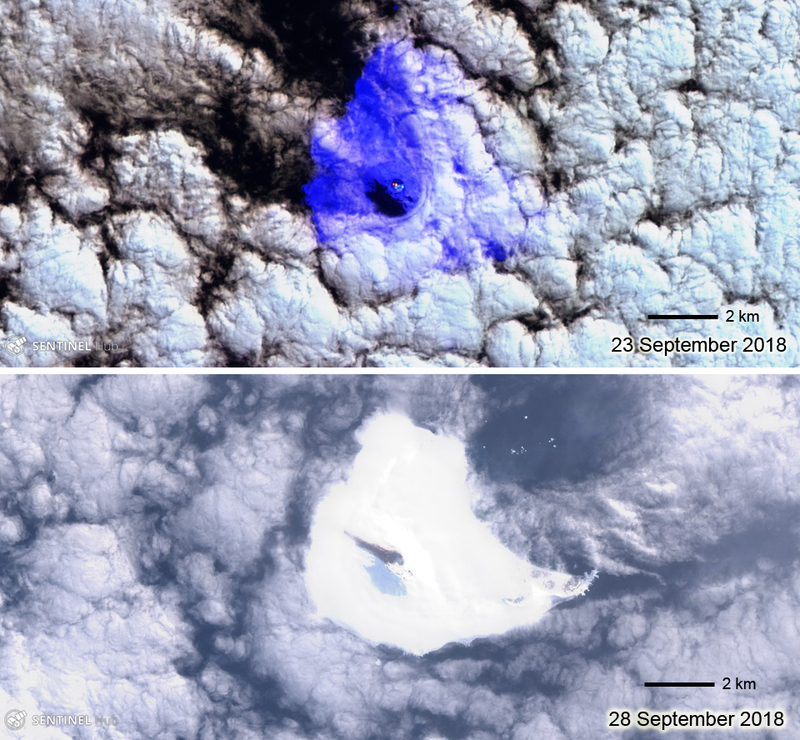 A white plume in low resolution NASA's Terra satellite data was spotted drifting away from Saunders in April 2016, but no thermal activity was reported. The only high-confidence data available from April 2016 through May 2017 is from the MODVOLC thermal alert system, which recorded two thermal alerts on 28 September 2016, one the next day, one on 30 October, and eight alerts on four days in November. Activity continued into January 2017 with one alert on 17 December 2016, and six alerts on 2 and 6 January 2017 (figure 11). Figure 11. Seventeen MODVOLC thermal alerts between 28 September 2016 and 6 January 2017 were the best evidence available for eruptive activity on Saunders Island from April 2016 through May 2017. Courtesy of MODVOLC. A low-level log radiative power MIROVA signal appeared in early June 2017; two more signals appeared in September 2017, one in early October and one in late November (figure 12). Additional signals plotted as more than 5 km from the source may or may not reflect activity from the volcano. Steam plumes were visible in NASA Terra satellite images drifting away from the island in August, October, and December 2017, but no thermal signatures were captured. Figure 12. The MIROVA log radiative power graph for Mount Michael on Saunders Island from 25 May-30 December 2017 showed intermittent heat sources that indicated possible eruptive activity each month except July and December. Location uncertainty makes the distinction between greater and less than 5 km summit distance unclear. More sources of evidence for activity became available in 2018 with the addition of the Sentinel-2 satellite data during the months of February-April and September. Multiple thermal signals appeared from MIROVA in January 2018 (figure 13), and the first Sentinel-2 satellite image showed a distinct hotspot at the summit on 10 February (figure 14). Figure 13. MIROVA thermal data for January-September 2018 indicated intermittent thermal anomaly signals in January, March, April, and July-September (top). A Sentinel-2 image with a hotspot was captured on 23 September, the same day as the MIROVA thermal signal (bottom). Courtesy of MIROVA. Figure 14. A Sentinel-2 image of Saunders Island on 10 February 2018 revealed a distinct hotspot and small steam plume rising from the summit crater of Mount Michael. Sentinel-2 image with Atmospheric Penetration view (bands 12, 11, and 8A), courtesy of Sentinel Hub Playground. A MODVOLC thermal alert appeared on 26 March 2019 followed by a significant hotspot signal in Sentinel-2 imagery on 29 March (figure 15). The hotspot was still present along with a substantial steam plume on 3 April 2018. Sentinel-2 imagery on 11 April revealed a large steam plume and cloud cover, but no hotspot. Figure 15. 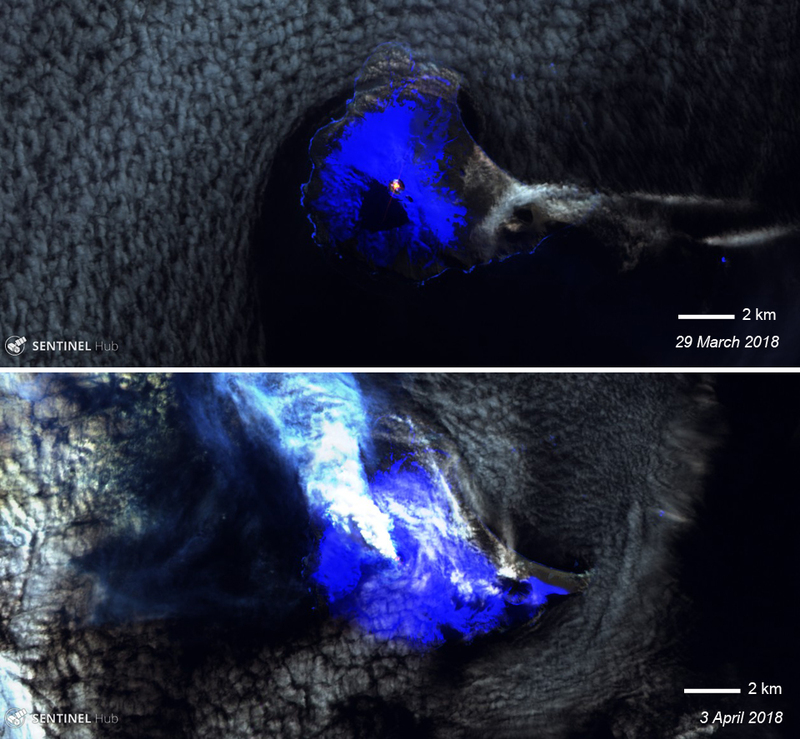 Hotspots in Sentinel-2 imagery on 29 March and 3 April 2018 indicated eruptive activity at Mount Michael on Saunders Island. Sentinel-2 image with Atmospheric Penetration view (bands 12, 11, and 8A), courtesy of Sentinel Hub Playground. MIROVA thermal signals appeared in mid-July and mid-August 2018 (figure 13) but little satellite imagery was available to confirm any thermal activity. The next clear signal of eruptive activity was evident in a Sentinel-2 image as a hotspot at the summit on 23 September. A small MIROVA signal was recorded the same day (figure 13, bottom). A few days later, on 28 September 2018, a Landsat 8 image showed a clear streak of dark-gray ash trending NW from the summit of Mount Michael (figure 16). Figure 16. Satellite imagery confirmed eruptive activity at Mount Michael on Saunders Island in late September 2018. Top: a hotpot in a Sentinel-2 image on 23 September coincided with a MIROVA thermal signal (see figure 13); Bottom: A Landsat 8 image on 28 September has a distinct dark gray streak trending NW from the summit indicating a fresh ash deposit. The lighter gray area SW of the summit is likely a shadow. Sentinel-2 image with Atmospheric Penetration view, (bands 12, 11, and 8A), Landsat 8 image with pansharpened image processing, both courtesy of Sentinel Hub Playground. Information Contacts: Hawai'i Institute of Geophysics and Planetology (HIGP) - MODVOLC Thermal Alerts System, School of Ocean and Earth Science and Technology (SOEST), Univ. of Hawai'i, 2525 Correa Road, Honolulu, HI 96822, USA (URL: http://modis.higp.hawaii.edu/); MIROVA (Middle InfraRed Observation of Volcanic Activity), a collaborative project between the Universities of Turin and Florence (Italy) supported by the Centre for Volcanic Risk of the Italian Civil Protection Department (URL: http://www.mirovaweb.it/); Sentinel Hub Playground, (URL: https://www.sentinel-hub.com/explore/sentinel-playground); NASA Worldview (URL: https://worldview.earthdata.nasa.gov/). The MODVOLC thermal alert system detected thermal anomalies over Michael’s summit crater during 30 September-7 October (GMT time, local -2). The first MODVOLC alerts at Mount Michael since May 2003 recently began, indicating an increased level of activity in the island's summit crater (and presumed lava lake). The alerts occurred on 3, 5, and 6 October. Although previous eruptions have been recorded in the South Sandwich Islands (Coombs and Landis, 1966), ongoing volcanic activity has only recently been detected and studied. These islands (figure 1) are all volcanic in origin, but sufficiently distant from population centers and shipping lanes that eruptions, if and when they do occur, currently go unnoticed. Visual observations of the islands probably do not occur on more than a few days each year (LeMasurier and Thomson, 1990). Satellite data have recently provided observations of volcanic activity in the group, and offer the only practical means to regularly characterize activity in these islands. Using Advanced Very High Resolution Radiometer (AVHRR) data, Lachlan-Cope and others (2001) discovered and analyzed an active lava lake on the summit of Saunders Island (figure 2) that was continuously present for intervals of several months between March 1995 and February 1998; plumes originating from the island were observed on 77 images during April 1995-February 1998. J.L. Smellie noted that during helicopter overflights on 23 January 1997 (Lachlan-Cope and others, 2001) "dense and abundant white steam was emitted from the crater in large conspicuous puffs at intervals of a few seconds alternating with episodes of less voluminous, more transparent vapour." Smellie also observed that the plume commonly extended ~8-10 km downwind. Figure 2. Map of Saunders Island, adapted from Holdgate and Baker (1979). Lighter shaded stippled areas show rock outcrop, the remainder is snow or ice covered. Relief is shown by form lines that should not be interpreted as fixed-interval contours. Courtesy Hawaii Institute of Geophysics and Planetology and British Antarctic Survey. The MODIS Thermal Alert system also detected repeated thermal anomalies throughout 2000-2002 in the summit area (figure 3), indicating that activity at the lava lake has continued. Anomalous pixels (1 km pixel size) were detected intermittently and were all 1-2 pixels in size, consistent with the relatively small confines of the crater. The timing of anomalous images in this study likely has more to do with the viewing limitations imposed by weather (persistent cloud cover masks any emitted surface radiance in the majority of images) than it has to do with fluctuations in activity levels, so this plot of radiance (figure 4) should not be used as a proxy for lava lake vigor. Figure 3. Selected MODIS images showing thermal anomalies on Saunders Island. Band 20 (3.7 µm) is shown here. Anomalous pixels on Saunders Island correspond to the lava lake in the summit crater of Mt. Michael volcano. Images are not georeferenced for purposes of radiance integrity, therefore coastlines are approximate. Courtesy Hawaii Institute of Geophysics and Planetology and British Antarctic Survey. The only previous report on the remote Michael volcano was in BGVN 28:02, which commented on a lava lake detected by satellite imagery over the period 1995-2002. A review of MODIS data for the period from that report (end 2002) to 16 March 2004 (UTC) reveals one thermal alert, on 7 May 2003 (UTC). No corroborative report is available, although previous alerts were interpreted as possibly representing lava lake activity. Information Contacts: Rob Wright, Luke Flynn, and Eric Pilger; MODIS Thermal Alert System, Hawaii Institute of Geophysics and Planetology (HIGP), School of Ocean and Earth Science and Technology, University of Hawaii at Manoa (URL: http://modis.higp.hawaii.edu/). The last reported activity of Mount Michael was noted in the SI/USGS Weekly Report of 12-18 October 2005. At that time the first MODVOLC alerts for the volcano since May 2003 indicated an increased level of activity in the island's summit crater and a presumed semi-permanent lava lake that appeared confined to the summit crater. Those alerts occurred on 3, 5, and 6 October 2005. Since that time there has been no additional information concerning Mount Michael and presumably little to no activity. Matt Patrick sent a new Advanced Spaceborne Thermal Emission and Reflection Radiometer (ASTER) image, collected 28 October 2006 over Saunders Island . In his opinion this is the best image collected to date owing to the lack of a plume obscuring the summit crater, which was a problem in all previous images. The improved image provides a clear view of the crater (figures 5 and 6). Figure 5. An ASTER image of Mt. Michael created using energy in the visible near-infrared wavelength ("VNIR"; bands 3-2-1, RGB), with the inset showing a closer view of the summit crater. There are two small near-IR anomalies (band 3, 0.807 microns wavelength) in the otherwise dark center of the crater, shown as red spots in the colored image. The two anomalies suggest very high temperatures and support the idea that fresh lava may reside at the surface or a shallow level in the crater. Courtesy of Matt Patrick. Figure 6. The ASTER Short Wave Infrared (SWIR; band 9, 2.4 microns) image with a conspicuous anomaly at the summit, with numerous saturated pixels. Courtesy of Matt Patrick. Analyzing the VNIR, SWIR, and Thermal Infrared (TIR) (not shown in figures 5 or 6) images together shows that the outer crater is 500-600 m wide, with a 180m high-temperature crater interior. The latter shows up as an SWIR anomaly and may indicate the rough extent of active lava flow being ~ 180 m wide. Matt Patrick chose Villarrica volcano in Chile for comparison to Mt. Michael (figure 7) since it presents a potentially good analogue in terms of morphology and activity style. Maximum radiant heat flux values were similar (up to ~ 150 MW), suggesting that the maximum intensity of activity may be similar. Mt. Michael shows a much lower frequency of thermal alerts, which may be the result of more frequent cloud cover in the South Sandwich Islands or a greater depth to molten lava in the Mt. Michael crater. Figure 7. The real-time satellite thermal monitoring (MODVOLC) radiant heat flux values for Michael and Villarrica volcanoes during the period 2000-11 November 2006. Courtesy of Matt Patrick. Table 1 shows a summary of thermal anomalies and possible eruptions from Moderate Resolution Imagine Spectroradiometer (MODIS) satellites since November 2005. The last reported activity of Mount Michael was noted in the SI/USGS (Smithsonian Institution/U.S. Geological Survey) Weekly Volcanic Activity Report of 12-18 October 2005 (see BGVN 31:04). At that time the first MODVOLC alerts for the volcano since May 2003 indicated an increased level of activity in the island's summit crater and a presumed semi-permanent lava lake that appeared confined to the summit crater. Those alerts occurred on 3, 5, and 6 October 2005. Table 1. Thermal anomalies measured by MODIS satellites for Mount Michael for the period 3 October 2005 to 1 November 2006. All of the anomalies appeared on the SW side of the volcano. Courtesy of Hawai'i Institute of Geophysics and Planetology (HIGP) Thermal Alerts Team. References. Lachlan-Cope, T., Smellie, J.L., and Ladkin, R., 2001, Discovery of a recurrent lava lake on Saunders island (South Sandwich Islands) using AVHRR imagery: Journal of Volcanology and Geothermal Research, vol. 112, no. 1-4, p. 105-116 (authors are members of the British Antarctic Survey). Information Contacts: Matt Patrick, Michigan Technological University, Houghton, MI; Thermal Alerts Team, Hawai'i Institute of Geophysics and Planetology (HIGP), School of Ocean and Earth Science and Technology (SOEST), University of Hawai'i, 2525 Correa Road, Honolulu, HI 96822, USA (URL: http://modis.higp.hawaii.edu/); John Smellie, British Antarctic Survey, Natural Environment Research Council, High Cross, Madingly Road, Cambridge CB3 0ET, United Kingdom (URL: https://www.bas.ac.uk/); ASTER Science Project Teams, United States and Japan (URL: https://asterweb.jpl.nasa.gov/). The frigid, remote, and uninhabited region of Michael volcano is seldom visited. Thermal anomalies detected by satellite-based MODIS instruments, processed using the MODVOLC algorithm by the Thermal Alerts System of the Hawai'i Institute of Geophysics and Planetology, provide some data about possible eruptive activity (BGVN 28:02, 29:03, 31:04, and 31:10). During 3-6 October 2005 there were three days with thermal anomalies (BGVN 31:04). MODIS data indicates that anomalous pixels were also detected on 19 December 2005 (20 December UTC) and on 20 January 2006 (21 January UTC) (BGVN 31:10). The most recently reported MODIS thermal anomalies indicated activity during 19-21 October 2006 (20-21 October UTC) and again on 31 October-1 November 2006 (BGVN 31:10). 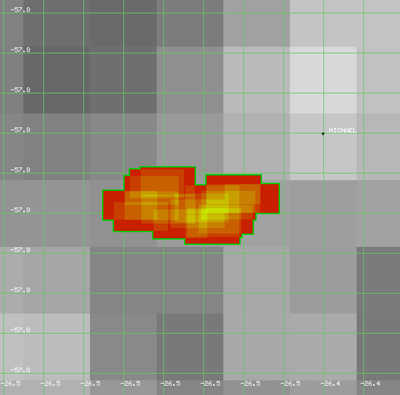 The source of these anomalies was an inferred lava lake in a central vent as shown on an Advanced Spaceborne Thermal Emission and Reflection Radiometer (ASTER) image collected 28 October 2006 (BGVN 31:10). Additional anomalies occurred on 13 November and 6 December 2006 (7 December UTC). No anomalies were measured after that date through May 2008. Since August 2000 there have been six periods when thermal anomalies were detected in satellite imagery (table 2). Table 2. Eruptive periods at Michael as inferred from MODIS thermal data from January 2000 through May 2008. Courtesy of the Hawai'i Institute of Geophysics and Planetology Thermal Alerts System. Matthew Patrick (USGS-HVO) notified Bulletin editors that in late 2012 images from thermal sensing satellites showed a 'new' active vent on Mount Michael on Saunders Island in the South Sandwich Islands (see location map, figure 1 in BGVN 28:02). This prompted scrutiny of the same vent in earlier images. Patrick noted that, although the vent was first identified in the 2012 images, it also appeared as activity in satellite images starting in 2006. The South Sandwich Islands are generally devoid of vegetation and habitants, and are largely ice-bound. Thus, satellite thermal alerts are strong evidence of volcanism. Patrick shared with us the following information from a paper by Patrick and Smellie (2013) about the vent, labeled as Old Crater (SE and outside of main crater, see figure 2 in BGVN 28:02). ASTER [Advance Spaceborne Thermal Emission and Reflection Radiometer] imagery provided "new information on the small subordinate crater, marked as 'Old Crater' by Holdgate and Baker (1979), presumably because it was inactive at the time of their observations." An ASTER image on 28 October 2006 showed an apparent SWIR [short-wave infrared] anomaly at Old Crater. The crater itself appeared to be snow-free and was approximately 150 m in diameter. An ASTER image from 5 January 2008, showed a steam plume coming from this vent, which appeared to be about 190 m wide, as well as a TIR [thermal infrared] anomaly. A very high resolution image from November 2009 available on Google Earth showed a small steam plume emanating from the crater, which is about 190 m wide (figure 8). An ASTER image from 17 November 2010, showed apparently recent eruptive activity in Old Crater, evidenced by tephra fallout emanating from the crater and a small TIR anomaly (at the time there was also a TIR anomaly in the main crater). According to Patrick and Smellie, the plume, tephra fall, SWIR anomalies, and crater enlargement (from 150 to 190 m) indicated that this vent had reactivated by late 2006. Figure 8. Annotated Google Earth imagery of Michael volcano (Saunders Island) acquired on 19 November 2009. (a) Saunders Island is mostly glacier covered, and steam plumes rose from the summit area. The scale bar indicates a distance of ~2.4 km. (b) A close up of the summit area that clearly shows steam plumes emanating from both the summit crater as well as the snow-filled 'Old Crater' (as termed by Holdgate and Baker, 1979). The scale bar indicates a distance of ~0.5 km. Courtesy of Google Earth. MODVOLC satellite thermal alerts measured from the volcano since our last Bulletin report (BGVN 33:04, activity through May 2008) and to 4 April 2013 are shown in Table 3. A solitary alert appeared 25 October 2008, followed by a four year period of apparent inactivity. Then, another solitary alert was measured in late June 2012, followed by alerts for two days in October 2012 and two days in November 2012. Patrick noted that occasional and sporadic alerts are very typical for Michael. Table 3. Satellite thermal alerts measured by MODVOLC over Michael from 2008-February 2013. Pixel sizes generally range from 1-1.5 km2. Note that previous satellite thermal alerts for Michael were listed in BGVN 31:10 (October 2005-November 2006) and 33:04 (August 2000-May 2008). Courtesy of MODVOLC. References. Patrick, M.R., and Smellie, J.L., 2013, A spaceborne inventory of volcanic activity in Antarctica and southern oceans, 2000-2010, Antarctic Science, v. 25, no. 4, p. 475-500. Holdgate, M.W., and Baker, P.E., 1979. The South Sandwich Islands: I. General description, British Antarctic Survey Scientific Reports, No. 91, pp. 1-76. Information Contacts: Matthew Patrick, Hawaiian Volcano Observatory (HVO), U.S. Geological Survey, PO Box 51, Hawai'i National Park, HI 96718, USA (URL: https://volcanoes.usgs.gov/observatories/hvo/); MODVOLC, Hawai'i Institute of Geophysics and Planetology (HIGP) Thermal Alerts System, School of Ocean and Earth Science and Technology (SOEST), Univ. of Hawai'i, 2525 Correa Road, Honolulu, HI 96822, USA (URL: http://modis.higp.hawaii.edu/). 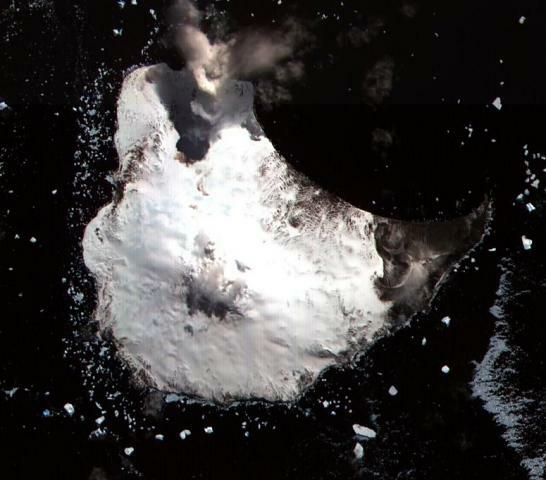 The Michael stratovolcano forms the emergent small, unpopulated, mostly ice-covered Saunders Island, part of the South Sandwich Islands. The volcano is primarily monitored using satellite imagery. Prior to August 2015, the most recent eruptive activity detected was in the second half of 2012 (BGVN 38:02). Infrared MODIS satellite data processed by MODVOLC showed thermal alerts at the summit of Michael during 28 August to 8 October 2015 (figure 9, table 4). MODIS data presented on the MIROVA site shows increased radiative power (measured from satellite thermal data) from late August through October 2015, with a very strong maximum near the end of August (figure 10); lower-power gradually decreasing detections during late November 2015-January 2016 may represent a cooling lava flow. It should be noted that cloud cover over a volcano may prevent the measurement of infrared data. Figure 9. MODVOLC map of measured thermal alerts (each colored rectangle represents a pixel) during 28 August through 8 October 2015. Courtesy of MODVOLC. Table 4. Satellite thermal alerts measured by MODVOLC over Michael during August-October 2015. Pixel sizes generally range from 1-1.5 km2. Courtesy of MODVOLC. Figure 10. 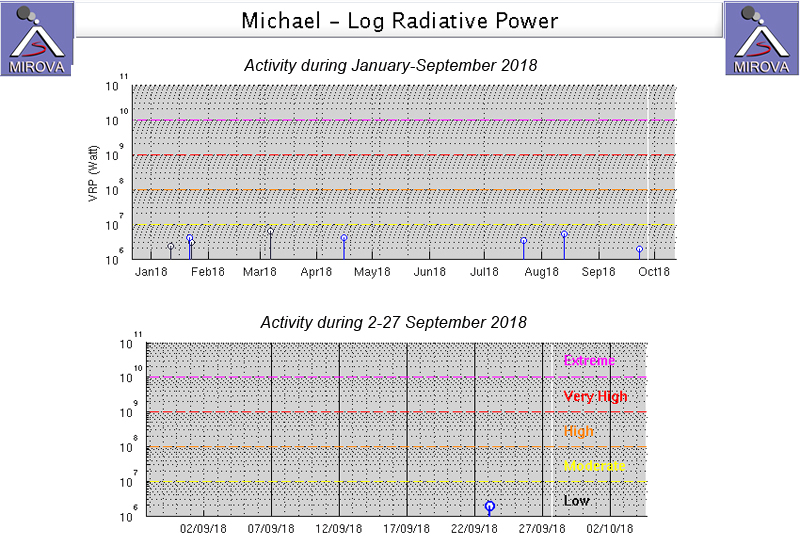 MIROVA graph showing radiative power measured by satellite over Michael during April 2015 to April 2016, with a strong maximum on the last day of August 2015. Courtesy of MIROVA. Saunders Island is a volcanic structure consisting of a large central edifice intersected by two seamount chains, as shown by bathymetric mapping (Leat et al., 2013). The young constructional Mount Michael stratovolcano dominates the glacier-covered island, while two submarine plateaus, Harpers Bank and Saunders Bank, extend north. The symmetrical Michael has a 500-m-wide summit crater and a remnant of a somma rim to the SE. Tephra layers visible in ice cliffs surrounding the island are evidence of recent eruptions. Ash clouds were reported from the summit crater in 1819, and an effusive eruption was inferred to have occurred from a N-flank fissure around the end of the 19th century and beginning of the 20th century. A low ice-free lava platform, Blackstone Plain, is located on the north coast, surrounding a group of former sea stacks. A cluster of parasitic cones on the SE flank, the Ashen Hills, appear to have been modified since 1820 (LeMasurier and Thomson, 1990). Vapor emission is frequently reported from the summit crater. Recent AVHRR and MODIS satellite imagery has revealed evidence for lava lake activity in the summit crater. Berninghausen W H, Neumann van Padang M, 1960. Antarctica. Catalog of Active Volcanoes of the World and Solfatara Fields, Rome: IAVCEI, 10: 1-32. Lachlan-Cope T, Smellie J L, Ladkin R, 2001. Discovery of a recurrent lava lake on Saunders Island (South Sandwich Islands) using AVHRR imagery. J. Volcanol. Geotherm. Res., 112: 105-116. There is data available for 20 Holocene eruptive periods. There is no Deformation History data available for Saunders. There is no Emissions History data available for Saunders. Glacier-covered Mount Michael stratovolcano dominates Saunders Island. Cordelia Bay lies between the Blackstone Plain (top) and the snow-free Ashen Hills (right), a cluster of parasitic cones on the SE flank. Ash clouds were reported from the summit crater in 1819, and an effusive eruption was inferred to have occurred from a north-flank fissure around the turn of the 19th century. Recent AVHRR and MODIS satellite imagery has revealed evidence for lava lake activity in the summit crater of Mount Michael. ASTER satellite image, 2002 (National Aeronautical and Space Administration, courtesy of ASTER science team). The Global Volcanism Program has no maps available for Saunders. There are no samples for Saunders in the Smithsonian's NMNH Department of Mineral Sciences Rock and Ore collection. Large Eruptions of Saunders Information about large Quaternary eruptions (VEI >= 4) is cataloged in the Large Magnitude Explosive Volcanic Eruptions (LaMEVE) database of the Volcano Global Risk Identification and Analysis Project (VOGRIPA).